I really enjoy working with Designers on various projects. They know they can call me with any type of request needed, and I can do it. Size is never an issue. 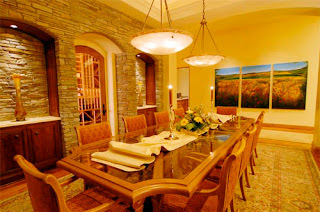 This project was for a home in Reno, NV. Designer, Sheryl Morgan needed a dramatic painting with lots of bold reds and golds to span the wall of the formal dining room. She thought a poppy field would be the perfect subject matter...split up into a three panel triptych. Here's a picture of the finished project. Room Photos for Art Book! Meet me in San Francisco!